Ada Nilsson was one of Sweden’s first female doctors, and a pacifist. She was also the editor-in-chief of the Fogelstadgrupp newspaper Tidevarvet. Further, she was a driving force behind several associations active on behalf of women’s rights, peace and democracy. Ada Nilsson was born in 1872 at Toarp farmhouse in Västergötland. Her father was an intermediary in the home-based textile industry. After her father died when Ada Nilsson was just 13 years old, her guardian brought her to Stockholm, where she attended the Lyceum school for girls. She graduated as a private student in 1891. That same year she began to study for a preparatory year to allow her to study medicine at Uppsala. This led her to meet Lydia Wahlström who had just set up Uppsala Kvinnliga Studentförening (the Uppsala women’s student association) in conjunction with several of the women who would become female pioneers in various careers. Ada Nilsson also got to know Alma Sundqvist who became a lifelong friend and colleague after she completed medical studies at Karolinska Institutet in Stockholm. In 1900 they both gained their medical licentiate degrees and became doctors, but as women they were not able to hold state-financed posts. This meant that Ada Nilsson and Alma Sundqvist could not be employed at state-run hospitals. Ada Nilsson therefore chose, after further studies in Germany, to specialise in gynaecology and to set up her own private practice. Having completed her specialisation service at various polyclinics in Stockholm she opened her first practice in 1904 on St. Paulsgatan in Stockholm. She was also in charge of the Serafim hospital gynaecological polyclinic for several years, and further served as a doctor at various children’s homes and girls’ schools. In 1912 Ada Nilsson moved to Triewaldsgränd 2 in Gamla stan where she also opened a new practice. Her home became a gathering place for the radical women and men of her time. Many associations were formed and run from her house, but she also always made time for women in need. She had already been involved with setting up Kvinnornas diskussionsklubb (the women’s discussion club) in 1907, and Föreningen Självförsörjande Bildade Kvinnors vilohem (the self-sufficient educated women’s association’s care home) in 1909 together with Alma Sundqvist. Both women were also active in Svenska föreningen för moderskydd och sexualreform (the Swedish association for the protection of mothers and sexual reform) (see Frida Steenhoff). Their struggle to gain professional rights connected them with Karolina Widerström, partly through the establishment of Kvinnliga Läkares Kommitté (the female doctors’ committee) in 1916 (which later became Kvinnliga Läkares Förening – the female doctors’ association). Ada Nilsson and Alma Sundqvist’s medical experiences led them to be heavily involved in the fight against prostitution, which was legal at the time. They highlighted the need for sexual education and asserted women’s right to abortion. They both wrote pamphlets on these issues. They also gave talks across the country. Following the so-called “Courtyard Crisis” (borggårdskrisen) of 1914 and the politically tense atmosphere in the country which led to the resignation of the Liberal Prime Minister Karl Staaff, Ada Nilsson and her colleague Julia Kinberg gathered a few like-minded people and set up Föreningen frisinnade kvinnor (the association of free-thinking liberal women), who were “against the psychosis of war, for democracy and the equality of women”. After the constitutional change in favour of universal suffrage in 1918/21 the association regrouped as a national association. In 1922 Elisabeth Tamm, one of the first five women to serve in parliament, invited her colleague Kerstine Hesselgren, the author Elin Wägner, the pedagogue Honorine Hermelin and Ada Nilsson for a meeting at her Fogelstad property in order to organise what would become Kvinnliga medborgarskolan på Fogelstad (the Fogelstad citizen school for women). It was at this point that Ada Nilsson and Honorine Hermelin began their lifelong friendship. The following year the group set up its own newspaper, Tidevarvet, and Ada Nilsson became its editor-in-chief and the main financer. Elin Wägner was its first editor. Tidevarvet was published from 1923 to 1936 as a politically radical weekly journal on societal issues such as peace and pacifism, women’s rights and improved conditions for mothers and children. In 1925 Ada Nilsson opened Tidevarvets Rådgivningsbyrå för föräldrar (Tidevarvet’s consultancy for parents) but after only three years the operation had to close due to lack of funds and local support. 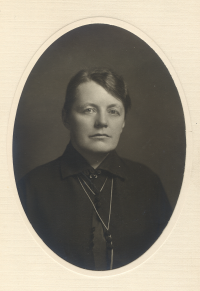 In 1929 Ada Nilsson became the head of the Stockholm division of Radikala Föreningen. Two years later she also became vice-chair of the umbrella organisation Svenska Kvinnors Vänsterförbund (Swedish women’s left-wing association), an enlarged reassembly of Frisinnade Kvinnors Riksförbund. Ada Nilsson and the association intensively supported Spanish women during the civil war there and in the ensuing war years they developed comprehensive support for refugees in Europe. Ada Nilsson was never a member of a political party; as a free-thinker she wanted to remain unbounded and to cooperate across borders to achieve peace and improved conditions for women and children. Many of her suggestions for reforms for mother’s and children’s care were taken up by the Befolkningskommissionen (the population commission) set up by the Social Democrats. Many were put into practice as part of the emerging “folkhemmet” (the people’s home). Ada Nilsson never became a Social Democrat. She was not a communist although she was sometimes accused of being one due to her close friendship with the Russian ambassador Aleksandra Kollontaj, whom she got to know when the latter came to Stockholm in the early 1930s. Ada Nilsson carried on as vice-chair of Svenska Kvinnors Vänsterförbund until 1950. At that point her eyesight became markedly impaired and in 1953 she closed her doctor’s surgery in Gamla stan. The years leading up to her death in 1964 she spent in poverty living with Honorine Hermelin at Fogelstad. Ada Nilsson is buried at Södra Säm cemetery in Västergötland. Ada Nilsson and her fellow pacifists have been immortalised in Siri Derkert’s refurbishment of Östermalmstorg subway station in Stockholm. Ada Konstantia Nilsson, www.skbl.se/sv/artikel/AdaNilsson, Svenskt kvinnobiografiskt lexikon (article by Kristina Lundgren), retrieved 2019-04-18. Föreningen Självförsörjande Bildade Kvinnors vilohem u.p.a.